Many people have a compulsion to snack. Unless you are trying to lose a lot of weight, there is really no health reason to give up snacking. All anyone has to do is substitute healthy foods for all junk food. While too much snacking is always possible, snacks are the ideal way to add raw foods to your healthy whole food diet. The only real caveat to snacking is to be sure to start out each day with a healthy breakfast. Otherwise, you might be easily tempted to begin snacking first thing in the morning. A mixture of raw nuts and dried fruit will give snackers a crunchy sensation that is very similar to eating a bag of junk food chips. It is a natural way to add raw nuts to your diet. 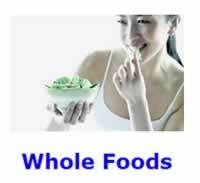 Almonds and walnuts are the healthiest choices in the nut category. Everyone should be eating at least one pound of raw almonds each week for their fiber, calcium and vitamin E content. Read the food labels to make sure that the nuts are raw rather than roasted and contain no flavorings or preservatives. Snacking on 100% cacao dark chocolate bars are a major food source of magnesium, antioxidants, and plant-based polyphenols and flavonols. 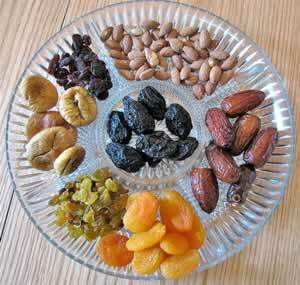 There are very large selections of different dried fruits to choose from for a healthy snack, such as raisins, chopped dates, prunes, and figs. Be sure to read the food labels to make sure that the dried fruit does NOT contain added sugar or preservatives. Eating raw whole fruit as a snack in itself such as apples, kiwi, bananas, grapes, pears, peaches, oranges, and tangerines are a natural. Vegetables like baby carrots, celery, radishes, scallions, and cucumbers eaten raw, make a healthy snack. Have you ever tried eating a slice of freshly baked homemade whole-grain bread? The taste is indescribably good for whole-grain bread lovers.